FHA loans are loaded with perks for today’s buyers, including a low down payment, and an allowance for up to 6% of closing costs to be paid by the seller. About the VA Energy Efficient Mortgage (EEM) program. Finance eco-friendly home improvements with your mortgage. An overview and today’s live mortgage rates. 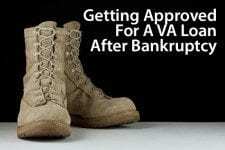 Experiencing a Chapter 7 or a Chapter 13 bankruptcy doesn’t mean that you’ll lose your hard-earned VA benefits, including access to the VA home loans. Mortgage rates are low and U.S. rents are rising, creating a rush of demand to purchase new homes. A look at how to get started in your planning process. The VA Home Loan Guaranty program is surging among aging military borrowers, who are using their GI Bill benefits to purchase second and retirement homes. The old real estate adage — “Location, location, location” — may not be the most important piece of advice today’s home buyers need to hear. A survey of 1,000 readers of TheMortgageReports.com shows that consumers think it’s too hard to get a mortgage approved in today’s mortgage market. Special loan program lets buyers do a cash-out refinance the next day after purchase. No special requirements. Program review & complimentary rate quote. Since 1944, the VA Home Loan Guaranty program has offered 100% financing for eligible veterans and servicemembers. Get approved for a VA home loan.